I know while I was sick it was really hard on my husband. At that particular time it was hard for me to understand just how hard. I was sick and feeling the pain. I couldn't breathe and my thoughts were literally consumed by it. After I began to get better I suddenly realized just how hard it is to be the caregiver. I cannot imagine the worry and fear going through the mind of someone who thinks they may lose their spouse. He compared it to that of one of my children. He asked how worried I was about them when they get sick and then asked now how much do you think I worried about you? Well I think that was really what made it hit home for me. You see, I never thought of myself as someone who needed care or protecting. I never felt like I needed to be kept safe. I have always taken care of the kids and the home. I didn't need anyone to take care of me. Suddenly I needed someone to do everything for me. He encouraged me to eat and gave me pep talks pretty much daily. I have written about it before but it really is something you never forget. I think about it sometimes. I think about it at moments like this picture I snapped last night. 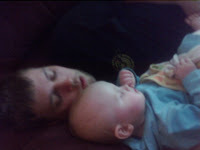 Hubby dozed off on the couch while holding Gabbi and she dozed too. I grabbed my cell phone and snapped this as quick as I could. It means so much more to me than a dad and baby sleeping but rather our little miracle baby and how he nursed me back to health and helped me through the cancer to get her here. Hi Sandi my wife is a caregiver so i know how hard it is because she tells me everyday. She takes care of the elderly. Have a great one Sandi. Your story is very inspiring. I know I said it before... but I really adnire your strength and faith. Godbless Sandi!